The once close-knit Lepcha community in North Sikkim is being torn apart over the issue of hydel projects on the Teesta and its tributaries. The rift within this Himalayan tribe has worsened in the wake of the scrapping of four projects in the Lepcha Protected Area of Dzongu. Following a year of protests and hunger strikes by Lepcha activists, the state government in June agreed to cancel four projects in Dzongu. 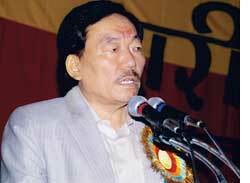 But Chief Minister P K Chamling refused to call off two larger, more controversial projects, saying the "majority of the people want it". Dawa Lepcha of the Affected Citi-zens of Teesta (act), the group leading anti-dam protests, termed Chamling's decision to cancel four projects a "bold green" one, but pointed out that they fell within the Kangchendzonga National Park and could have been challenged in court. "If the government takes our land our future will be dark. If the projects are scrapped then the division between our people too will end." "A lot of us feel that the state should go slow on these projects, but few want to speak out because there's no room for healthy discussion." Anti-dam activists have been demanding the state government review its plans for 27 hydel projects in the state and at the very least cancel six projects in and around Dzongu, the last bastion of the Lepchas. But not everyone in Dzongu wants the projects gone and differing opinions have soured relations within the community. "Dzongu isn't what it used to be. Our families are fighting each other," said Gyatso Lepcha, a young act activist. "When my uncle who's pro-projects walks by, we don't even look at each other. It's painful." Pro-projects villagers say the dams will bring development to the area and improve their lot. "Our children need jobs. Already our boys are getting unskilled jobs at project sites. Dzongu can't remain in darkness forever," said Choden Lepcha, Dzongu's milk board chairman. "I don't know much about environmental impact, but the government has assured us that the dams will be safe," said Kadzangmu Lepcha, a panchayat member in Dzongu's Pasendang village. "The projects will only do us good." Anti-projects villagers say many people don't speak out against the dams because they fear reprisals from the Sikkim Democratic Front that has been in power for 14 years. "Almost every family in Sikkim has a member who's a government employee and few want to put their jobs at risk," said Loden Lepcha, who runs a primary school in Dzongu. The mostly run-of-the-river projects proposed on the flood-prone Teesta and its tributaries--part of the Indo-Mayanmar biodiversity hot spot--have raised concerns among environmentalists regarding their cumulative impact on the landslide- and earthquake-prone Himalayan landscape. The Teesta River Valley system sustains several tribal and indigenous communities, including the Lepchas, Bhutias, Sherpas and Nepali ethnic groups, who have traditional natural resource-based livelihoods. "The state should go slow on these projects. Why not first study how the new Teesta Stage V dam at Dikchu works?" asks Chukie Tobden of the Concerned Citizens of Sikkim, a group that campaigned against the Rathong Chu hydel project in the 1990s and is now supporting the act initiative. The Dikchu dam in North Sikkim, inaugurated last year, is in trouble. The protection wall of its reservoir collapsed twice in June following incessant rain and silt build-up and the project had to stop operations for seven weeks. Environmental concerns aside, Lepcha activists say the projects in Dzongu, their sacred land, are a threat to the Lepcha identity. They worry the projects would lead to an influx of outsiders and that would marginalize Lepchas in this last bit of land reserved for them. But with the current rift within their community it seems the Lepcha sense of identity also stands threatened from within. "When I've made a promise to the people it will be kept"
We want development. However, as a responsible Himalayan state, we have the sacred obligation to conserve and promote our ecosystem. We often forgo developmental interventions conceived at the national level to protect our environment. We are called upon to strike a fine balance between ecological sustainability and developmental needs of our people. Consequently, we scrapped the Rathong Chu hydel power project in West Sikkim in 1996 even after we had invested over Rs 20 crore. Similarly, we scrapped four hydropower projects in Dzongu area recently. This was also because the Lepchas said Dzongu is their sacred land, though this is the first time such an issue has come up. That will go on as planned. The people of Dzongu want it for their own development. Those opposing it are less than 10 per cent of the local population. Sikkim is a landlocked state that doesn't have any major industry, but it has a lot of natural resources. We need to make use of these resources in an eco-friendly way. We are fully conscious of our competitive advantage of being a green state rich in biodiversity. That is why we declared the year I took over, 1995, as Harit Kranti Varsh to generate mass awareness. We have introduced many innovative green initiatives over the last one-and-a-half decades, including bans on use of non-biodegradable materials like plastics, killing wildlife and felling green trees. Of late, we have also initiated a Green Mission Plan that envisages mass plantation. Our forest cover has increased from 43.9 per cent in 1993-94 to 45.97 per cent in 2005-06. All our environment conservation measures, in essence, are an adoption of what environmental scientists call the low-carbon economy. We have instituted an Environment Commission. We have also undertaken the first ever initiative in the country to institute a Glacier and Climate Change Commission in January 2008. Low-volume, high-value industries, including agro-based industries, especially floriculture and apiculture, eco-friendly tourism and water based industries like hydel power form the bedrock of our developmental strategies. We have several micro-hydel projects being implemented, but we need a combination of both mini- and mega-hydel projects for our development. Whenever development work is undertaken, there is bound to be reaction. There were initial reactions in Sikkim as well. But it is important to first determine who is complaining and why. In our case, there were certain groups of vested interest trying to scuttle our development agenda. They do not represent the views of the majority. There is no logic to their protests. Ninety per cent of power projects are run-of-the-river type, which will run the water through underground tunnels. This will ensure minimum damage to our landscape. Yes, ecologically, I admit that some aquatic life may be damaged, but it is for the greater good of the country. The focus has been on benefiting local people where projects are being commissioned. In 14 projects so far, only seven households have been displaced. We have adequately rehabilitated them. This could be a rare example in the country of causing minimal damage to our topography while undertaking such projects. Through active public support 90 per cent of our goal has been fulfilled. We are confident of making Sikkim fully organic by 2015. If the goal is missed, then it will be the agriculture department's fault. It will be because of their lack of knowledge, effort and inefficiency. I've given them a mission and they are delaying. This is a problem not just in Sikkim but all over India. People concentrate on the negatives. Everytime I try to do something, my officials first say, "This can't be done." I haven't come across one official who says at the first instance, Yes, this can be done." I admit I'm a politician and there are many things whose technical aspects I may be ignorant of, but when I've made a promise to the people it will be kept. My vision is for development in a holistic sense, bringing qualitative change in the lives of the people. Development only in the materialistic sense has already undermined human aspects too many times for so long. I would like to see Sikkim's cities become like Singapore and our villages like Switzerland--rural living with all the basic modern amenities. Above all, I have a dream to see the people of Sikkim happy and contented and as the builders of their own collective destiny.